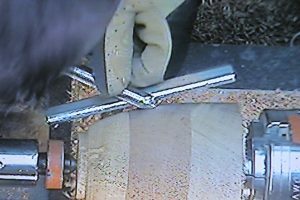 Ellsworth Signature Gouge – Raed EL Sarraf | South Auckland Woodturners Guild Inc. The challenge for this evening was to produce a bowl made from a 125mm Rimu cube using only the “Ellsworth Signature Gouge”. Raed then explained and demonstrated the various cuts made with this gouge. Roughing Cut- Raed explained how to present the gouge, axial pitch of the gouge 45 degrees, shaft horizontal on the tool rest. He then identified the cutting area of the gouge. He then proceeded with the removal of the corners and the rough shaping of the outside of the bowl. Using the gouge in this manner, large quantities of wood can be removed very quickly; the surface left on the wood however is pretty rough. Following the rough shaping of the bowl, the slicing cut was used. But before commencing with the slicing cut, Read first cut the spigot, to allow remounting of the bowl at a later stage. Slicing Cut- Gouge presentation, axial pitch 45 degrees, shaft 20-30 degrees on tool rest. The final form of the bowl was now further refined. This cut also resulted in a lot less tear-out compared to the roughing cut. With the shaping of the outside completed, it was now time to finish the outside of the bowl by using the shear scraping cut. Shear scraping Cut- Gouge presentation, axial pitch 85 degrees, shaft 45 degrees on tool rest. With this cut, Read was able to put a very smooth surface on the bowl. Only minimal sanding would be required to finish the exterior of the bowl. 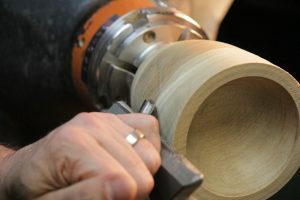 The bowl was now remounted using a scroll chuck. 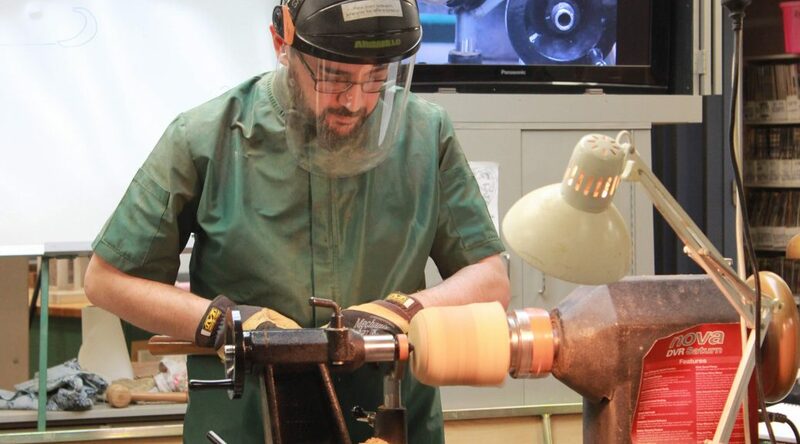 Raed then preceded roughing out the interior of the bowl by using the Interior Roughing Cut, this cut is basically the same as the roughing cut used on the exterior of the bowl. Interior Roughing Cut- Gouge presentation, axial pitch 45 degrees, shaft horizontal on tool rest. Read explained the importance of body movement and position during the execution of this cut. 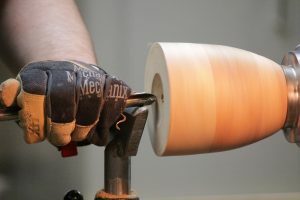 With the roughing out of the interior of the bowl completed, the Interior Finishing Cut was used to make the final cut on the interior in preparation for sanding. Interior Finishing Cut- Gouge presentation, axial pitch 0 degrees, shaft horizontal on tool rest. Before commencing this cut however, Raed first made a 6 mm deep cut to support the bevel when starting the interior finishing cut. Using this cut Read achieved a very smooth interior surface of the bowl. All in all it was a very well executed and interesting demo. Thank you Raed.